REX-POL offers the smokehouses for catering business, small production lines and supermarkets. 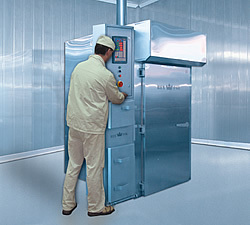 Thanks to the small dimensions (comparing to the standard smokehouse) the unit can be installed in a shop, restaurant or production compartment. High-class microprocessor controller ensures automated regulation of parameters of every process inside the chamber and allows for saving the data for HACCP purposes.